KnowledgeTree is a portal for our learning support architecture. The architecture provides adaptive, dynamic access to the course material and diverse learning resources distributed over multiple resource servers. KnowledgeTree is a relatively adaptive portal that provides access to resources within a hierarchy of course objectives provided by a course teacher. 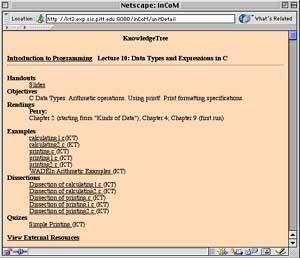 The interface provided by KnowledgeTree resembles a static "Course Materials" page. However, it is not static. KnowledgeTree retrieves educational materials from various servers, monitors your activity and adapts to your level of knowledge. Dissections: teacher comments related to lines of the program examples for those who need further explanation beyond the class presentation (using the WebEx system as an activity server). Quizzes: multiple practice opportunities for self-assessment of basic constructs (using QuizPACK system as an activity server). With each attempt, the questions remain the same, however the numbers are different. Failing to predict the target value indicates that further work is required. To access KnowledgeTree system and its content you have to login. First time user have to register creating a username and a password (see below).